Twitter is powerful and simple indeed. But then developers were not stopping on creating and obviously developing new applications to make it even stronger. 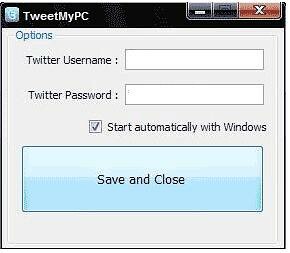 TweetMyPC is a freeware application which enables you to utilize Twitteras a way of sending commands to your PC remotely. Sending commands to your PC remotely sounds very cool. But the negative thing here is that TweetMyPC only provides Shutdown, restart, and log off commands for now. Though, it is still a very good application. So, to start things up, it’s recommended to create a separate Twitter account for this one. Then download and install TweetMyPC on your computer. Login your Twitter account on TweetMyPC and you’re on the go. Just tweet the command and TweetMyPC will do it for you. Very simple. Take note that these commands are case sensitive.